Introduction: True aneurysms of the innominate artery are rare and continued controversy exists in literature regarding the best management of these aneurysms. Patients and Methods: The present study reviewed a 5-year experience of managing IA true aneurysms between 2010 and 2015. 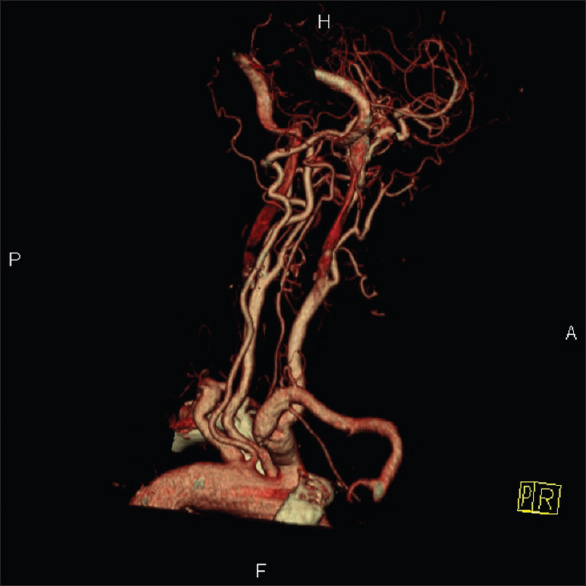 There were two patients aged 63 and 77 years who were treated successfully by a selective open debranching technique for the exclusion of the aneurysms. The mean follow-up was 2 years. Preoperative information was derived from spiral computed tomography (CT) scanning, magnetic resonance imaging, and color Doppler imaging (CDI). Results: One male and one female were treated successfully. The most common indication for intervention was transient ischemic attack (100%). The 30-day surgical mortality was zero. Graft patency at 6 months as confirmed by CDI was 100%. 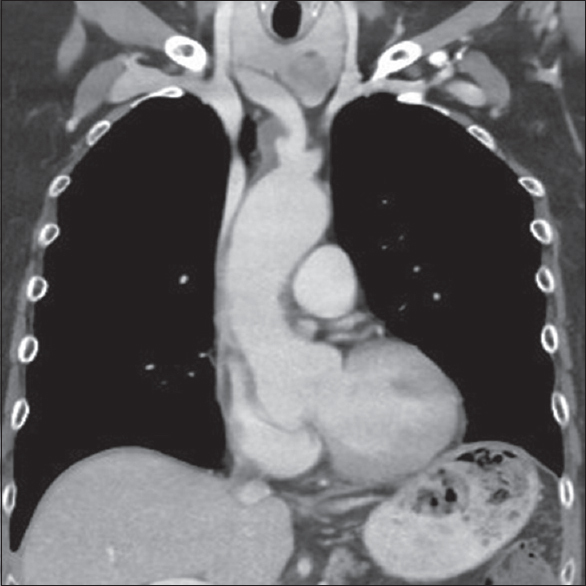 One patient had graft-related complication at 6 months and subsequently at 24 months which was revised successfully. Conclusion: Exclusion bypass is a satisfactory treatment of these proximal aneurysms and durable. The proximity to the aortic arch makes endovascular treatment challenging and would depend on the dimensions of the arch and ascending aorta. De-branching simplifies the treatment pathway. The natural history of these isolated aneurysms is unknown. The latter is unusual with earlier detection. The natural history of pure innominate aneurysm is still uncertain. The more common scenario is the presence of aneurysmal ascending aorta or arch aneurysms associated with innominate aneurysms. The treatment paradigms will be influenced by the extent of aneurysm distribution. Larger aneurysms of the innominate artery in isolation or in association with arch pathology will need extensive surgery. However, smaller aneurysms presenting with embolization can be treated by exclusion bypass. Ongoing expansion of the aneurysm still remains a concern but should be weighed against elderly patients with significant co-morbidities. We present two patients with IA aneurysms who presented with neurological sequelae following embolic showers into the cerebral circulation. A 63-year-old Maori female was referred to our vascular outpatient clinic for the management of transient ischemic attacks (TIAs). She had 5 episodes of TIAs (3 episodes involving her right upper limb, 2 episodes involving her left upper limb, and associated with speech disturbance. She had a past medical history of Stage 3 ovarian cancer (T3N2M3), a 50 pack year smoking history, chronic obstructive airways disease, and dyslipidemia. She was undergoing chemotherapy with cisplatin while awaiting a laparotomy for resection of the ovarian cancer deposits in the peritoneum. She had a family history of Marfan's syndrome with her grandson passing away suddenly at 18 years after repeated cardiac surgery. Her sister was diagnosed with neurofibromatosis recently. On examination, she was afebrile and hemodynamically stable with a full complement of pulses and in sinus rhythm. Her neurological examination was unremarkable. She was referred for an outpatient color Doppler imaging (CDI) of her carotid arteries. She was commenced on single antiplatelet therapy with aspirin 100 mg daily. CDI did not show any significant disease of her carotid arteries. Subsequently, she underwent a CT scan of her aorta which showed a dilated aortic root measuring 38 mm and a saccular aneurysm of the IA (Type B) involving both common carotid arteries. A significant amount of thrombus was seen in the aneurysm which was thought to be the cause for her symptoms [Figure 1]. Her imaging was discussed at a multidisciplinary meeting, and it was decided to offer her a reverse debranching procedure to exclude the aneurysm and embolic shower to the brain. 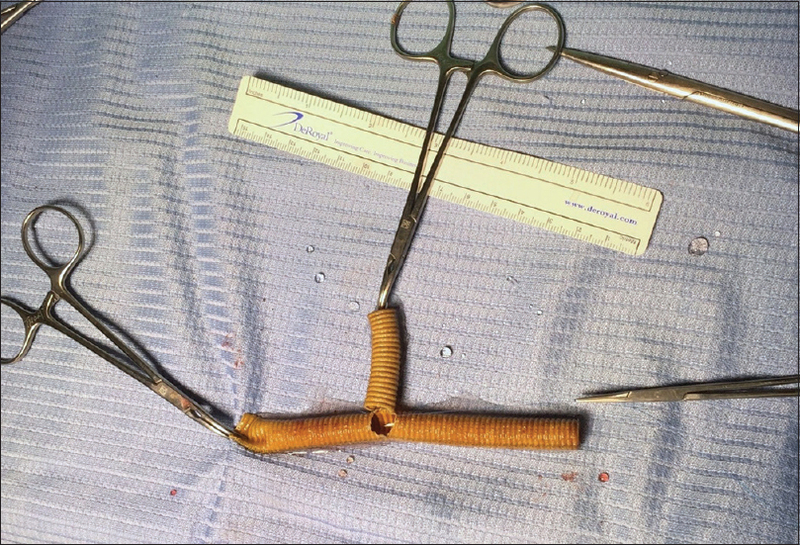 A left subclavian to left and right common carotid bypass was performed using a Dacron graft prepared on bench as shown in diagram [Figure 2]. Both carotid arteries were ligated proximal to the anastomoses. The graft was tunnelled in a pre-tracheal fashion. A 77-year-old male was referred to our institution from a peripheral hospital after an episode of collapse and left lower limb weakness that got resolved within 24 hours. He had a similar episode four years prior requiring admission to hospital. He was an ex-smoker with well-controlled hypertension. CDI showed no significant stenosis in the carotid arteries. The right vertebral showed bidirectional flow with flow velocities suggestive of up to 50% stenosis in the proximal subclavian artery. A CT scan of the Circle of Willis showed 33.8 mm aneurysm of the IA (Type A) just at the bifurcation of the right subclavian and the right common carotid arteries [Figure 3]. There was a significant thrombus within the aneurysm causing up to 88% stenosis based on diameter measurements performed on CT scan [Figure 4]. A left common carotid to right carotid and subclavian bypass was performed using a Dacron graft. The right carotid and subclavian arteries were ligated proximal to the anatomoses. 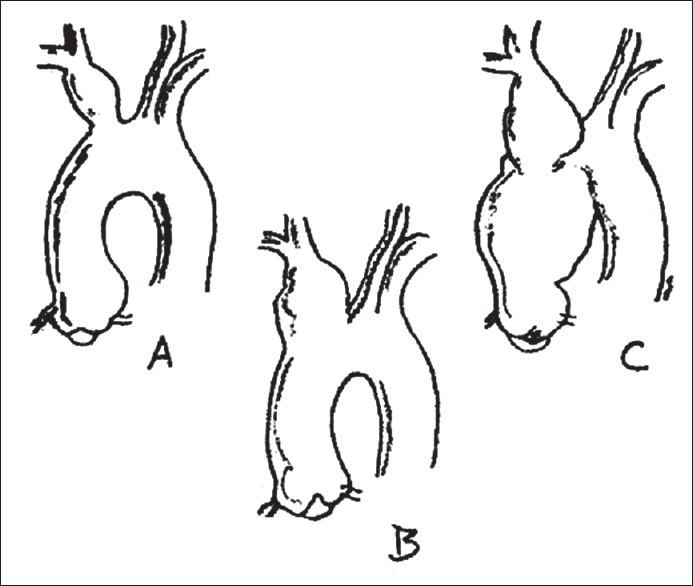 The graft was tunnelled in a pre-tracheal fashion [Figure 5]. Both patients had a successful outcome. The most common indication for intervention was TIA (100%). The 30-day surgical mortality was zero. Short-term graft patency (<30 days) as confirmed by CDI was 100%. Long-term graft patency (>30 days) as confirmed by CDI was 100%. One patient had graft-related complication at 6 months and subsequently at 30 months which was dealt with successfully using a vein graft. Mean follow-up time 24 months. Kieffer et al. mentioned that patients with isolated asymptomatic aneurysms who are at high surgical risk should undergo surgery when the aneurysms are saccular or when their maximum transverse diameter is more than 3 cm. Group A aneurysms (no involvement of the origin of the IA) are easy to treat but rare. After distal revascularization using bypass grafting from the ascending aorta, the aneurysm can be excluded using ligation at the origin. Group B aneurysms (involvement of the origin of the IA) are the most common. Surgical treatment requires aortic clamping. Side-clamping may be possible if lateral suture of the aorta is sufficient. Cross-clamping is required in many cases, including for patch angioplasty. If the left common carotid and subclavian arteries are patents, only minimal cerebral protection, such as the moderate administration of heparin (1 mg/kg) and the stabilization of arterial pressure, is required. If the aneurysmal process includes the left common carotid artery, especially in patients with a common trunk for the IA and left common carotid artery, the best technique consists of sequential revascularization from the ascending aorta to the left common carotid artery and IA. Surgical treatment for IA aneurysms has made great strides in the last two decades. Souttar  as early as 1934 described surgical repair of an IA aneurysm by ligation using a kangaroo tendon ligature and applying digital pressure to the arteries under local anesthesia. Cormier in 1957 stated midline sternotomy as the exposure technique of choice to repair IA aneurysms. The most frequently documented approach for IA pathology uses a median sternotomy. In our study, we used a cervical approach to debranch the involved arch vessels and exclude the IA aneurysm, thereby reducing embolic shower into the cerebral circulation. While the aneurysms were partially excluded, a theoretical risk of sac pressurization exists. This could easily be managed using a plug or amplatz device at the origin of the IA thereby excluding the aneurysm completely. Maintenance of cerebral blood flow is important in any type of intervention undertaken to exclude the aneurysm. ,,, In our study, we used a left to right crossover vein graft to perfuse the right cerebral circulation when dealing with the potential issue of graft infection requiring a total explant. The authors recommend a staged debranch procedure using a cervical approach for the affected arch vessels together with an occlusive device at the origin of the IA to exclude the aneurysm in high-risk patients. Gay BB Jr., Walker JF. 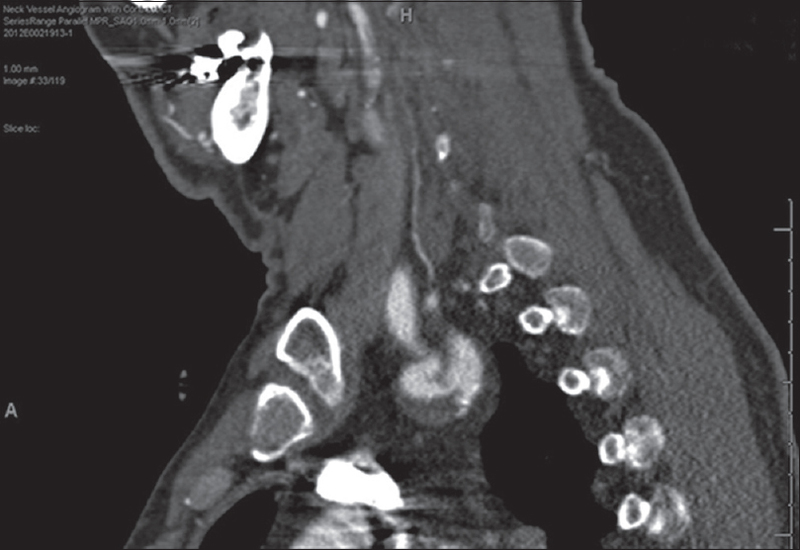 Aneurysm of the innominate artery; review of clinical and radiologic findings in 18 cases. Radiology 1953;60:804-13. Gordon-Taylor G. The surgery of the innominate artery, with special reference to aneurysm. Br J Surg 1950;37:377-404. Dominici C, Giusti D, Ferri M, Cappotto FP, Covarelli P, Cordellini M. Aneurysm of the innominate artery: Pathology simulating pulmonary neoplasm. Minerva Chir 1989;44:1107-10. Takaba K, Aota M, Koike H, Konishi Y. Surgical treatment for intrathoracic aneurysm of the innominate artery in an 83-year-old asymptomatic woman. Jpn J Thorac Cardiovasc Surg 2004;52:194-7. Yuan SM, Tager S. Penetrating atherosclerotic ulcer aneurysm of the innominate artery. Vasa 2009;38:263-6. Da Col U, Koukoulis G, Di Bella I, Ramoni E, Ragni T. Surgical treatment of ascending aorta and innominate artery trunk aneurysm with displaced brachiocephalic vessels. J Cardiovasc Med (Hagerstown) 2007;8:852-4. Huang CL, Kao HL. Endovascular management of post-traumatic innominate artery transection with pseudo-aneurysm formation. Catheter Cardiovasc Interv 2008;72:569-72. Saito A, Shiono M, Yamamoto T, Inoue T, Hata M, Sezai A, et al. Surgical treatment for innominate artery aneurysm with a coronary pulmonary artery fistula: A case report. Ann Thorac Cardiovasc Surg 2005;11:55-8. Schumacher PD, Wright CB. Management of of arteriosclerotic aneurysm of the innominate artery. Surgery 1979;85:489-95. Machado L, Abreu A, Vilaça I, Pinho P, Teixeira J. Surgical management of an innominate artery aneurysm. Rev Port Cir Cardiotorac Vasc 2013;20:45-8. MacLean AA, Vricella LA, Freischlag JA. Innominate artery aneurysm. Eur J Cardiothorac Surg 2007;32:803. Ferreira-Piña B, Ramírez-Castañeda S, Prado-Villegas G, Careaga-Reyna G, Argüero-Sánchez R. Surgical treatment of an innominate artery aneurysm: Case report of incidental finding during myocardial revascularization. Cir Cir 2009;77:57-60. Kieffer E, Chiche L, Koskas F, Bahnini A. Aneurysms of the innominate artery: Surgical treatment of 27 patients. J Vasc Surg 2001;34:222-8. Butman S, Gardin JM, Knoll M. Innominate artery aneurysm with thrombus: Detection by two-dimensional echocardiography. J Am Coll Cardiol 1983;2:387-90. Guibaud JP, Laborde MN, Dubrez J, Elia N, Remes J, Rosato F, et al. Surgical repair of an aneurysm of the innominate artery with fistulization into the trachea. Ann Vasc Surg 2001;15:412-4. Ikonomidis JS, Kim PY, Crawford FA Jr. Repair of aortic arch coarctation and innominate artery aneurysm with branched Dacron graft. J Thorac Cardiovasc Surg 2004;127:579-81. Trent JC. Ligation of the innominate artery for innominate aneurysm using rubber bands; report of a case. Surg Gynecol Obstet 1946;82:463-70. Zintel HA, Risbeck EC. Aneurysm of the bifurcation of the innominate artery. Successful excision and restoration of the carotid artery. Am J Surg 1960;99:929-33. Souttar HS. Aneurysm of the innominate artery treated by proximal ligature. Br Med J 1934;1:1066-8. Frye TA, DeLuca SA. Innominate artery aneurysm. Am Fam Physician 1985;31:169-70. Takach TJ, Lalka SG. Innominate artery aneurysm: Axial reconstruction via a cervical approach. J Vasc Surg 2007;46:1267-9. Maddox K. Aneurysm of the innominate artery. Med J Aust 1948;2:616. Soylu E, Harling L, Ashrafian H, Anagnostakou V, Tassopoulos D, Charitos C, et al. 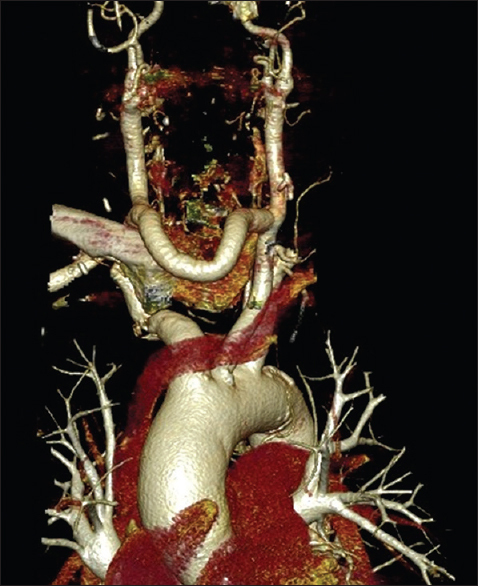 Surgical treatment of innominate artery and aortic aneurysm: A case report and review of the literature. J Cardiothorac Surg 2013;8:141. Axisa BM, Loftus IM, Fishwick G, Spyt T, Bell PR. Endovascular repair of an innominate artery false aneurysm following blunt trauma. J Endovasc Ther 2000;7:245-50. Bush RL, Hurt JE, Bianco CC. Endovascular management of a ruptured mycotic aneurysm of the innominate artery. Ann Thorac Surg 2002;74:2184-6. Chandler TA, Fishwick G, Bell PR. Endovascular repair of a traumatic innominate artery aneurysm. Eur J Vasc Endovasc Surg 1999;18:80-2. Puech-Leão P, Orra HA. Endovascular repair of an innominate artery true aneurysm. J Endovasc Ther 2001;8:429-32. Kirby CK, Johnson J. Innominate artery aneurysm treated by resection and end-to-end anastomosis. Surgery 1953;33:562-6. Malgor RD, Bilfinger TV, Tassiopoulos AK. Reversed sequence arch debranching for treatment of a ruptured juxta-innominate artery saccular aneurysm. Vasc Endovascular Surg 2013;47:151-4. Nakashima S, Kikuchi Y, Sakurada T, Hachiro Y, Kagaya H. Simultaneous surgical treatment for distal aortic arch aneurysm associated with innominate artery aneurysm and coronary artery disease. Nihon Kyobu Geka Gakkai Zasshi 1997;45:778-82. Yamazaki M, Hachiya T, Yamashiro M, Hanai M, Taguchi S, Onoguchi K. Surgical treatment of innominate artery aneurysm using temporary bypass to prevent cerebral ischemia. Kyobu Geka 2014;67:813-6.